Ancient cultures have always used egg-shaped vessels for storing seeds, food and water. When a clay earthen water dispenser is shaped like an egg, the water contained within, takes on a life of its own—literally. Within an egg-shaped clay earthen water dispenser, water’s receptive potential is maximized. It reaches its most refined energetic state in perfect balance and equilibrium. This is because clay allows water to breathe—which keeps water cool. Cool, dense water at the outer edges of an egg-shaped clay earthen water dispenser sinks to the bottom, forcing warmer water to rise up the center. The process ensures constant cooling and it enhances the continual circulation of energy. No stagnant area exists. As water circulates, molecules assume a tightly packed, refined, crystalline network while gasses become latent. Hydrogen retreats into the molecular cages formed as water becomes a liquid crystal. The egg has both a masculine and a feminine pole. The masculine pole is the narrow end; the feminine pole is the broad end. 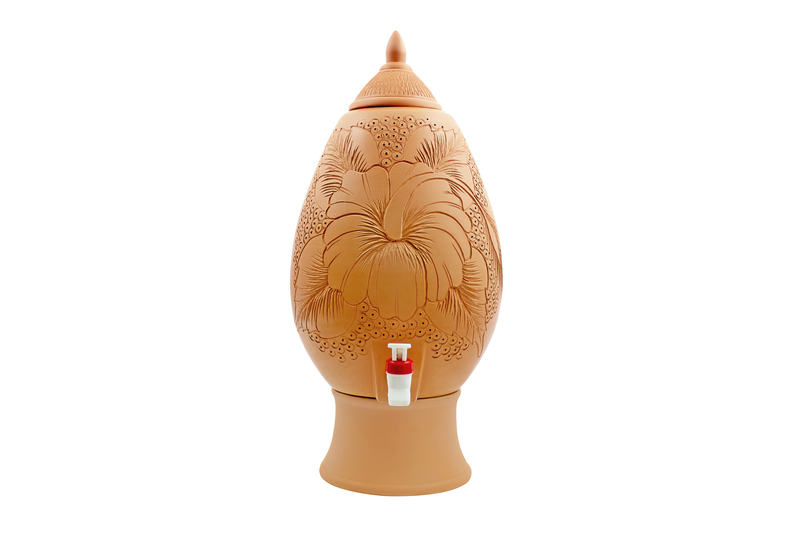 Depending on which end is placed downward, egg-shaped clay earthen water dispenser will produce either feminine (yin) water or masculine (yang) water. Yin water is most beneficial for regular drinking. It supports the creative forces of regeneration and healing. Yang water is ideal for plants. Yang water is also good for periods of cleansing and detoxification. Although a clay earthen water dispenser will structure and refine water—even cleanse it with time—the process will be enhanced if the clay earthen water dispenser is kept away from electromagnetic fields and devices.